Gently hose the affected area with plain water, then, apply a shampoo mix with a sponge. The mix should be 3-4 ounces of shampoo, diluted in a small water bucket (2 gallons). 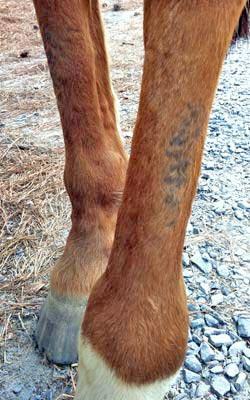 Leave the shampoo mix on your horse for at least 10 minutes so that it has time to work on the infection. Hose off and towel dry. For particularly tough areas, such as the front of the cannon bones shown on this page, apply shampoo directly onto a wet sponge and massage it into the legs. Legs must be wet first. Leave sudsy shampoo in place for at least 10 minutes. Repeat daily until required result is achieved. 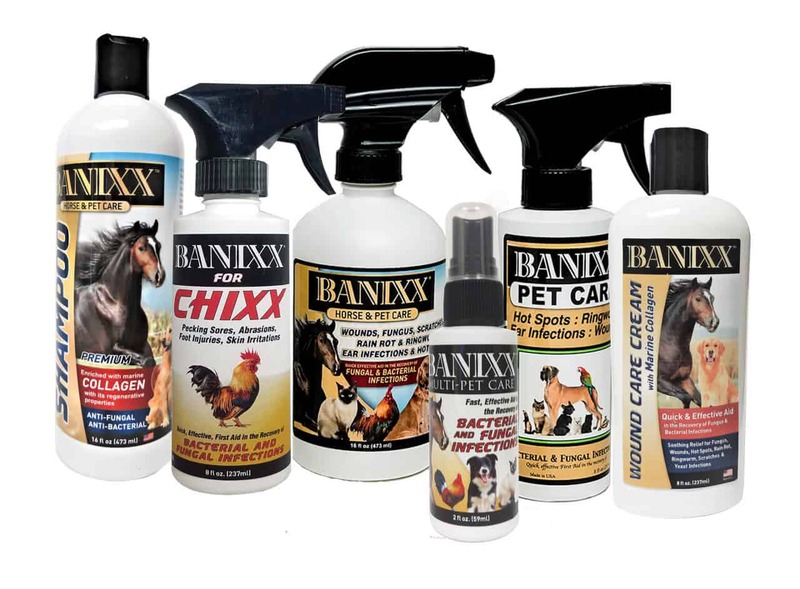 For Scratches and Rain Rot infections, the regular Banixx spray may be used to “finish” the process since it is a “leave-on’ application. 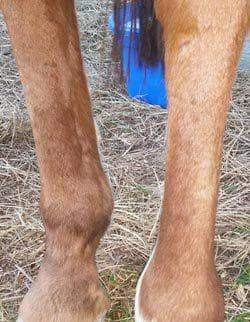 Equine Cannon Keratosis (also known as Stud Crud, Leg Funk, Cannon bone crud) is a skin condition caused by the horse’s own skin glands. It manifests itself in a waxy paste that glues the hair to it. It is not fungus, bacteria, scratches, or caused by urine. It is actually a case of seborrhea (think flaky and scaly skin), and it can be primary or secondary. 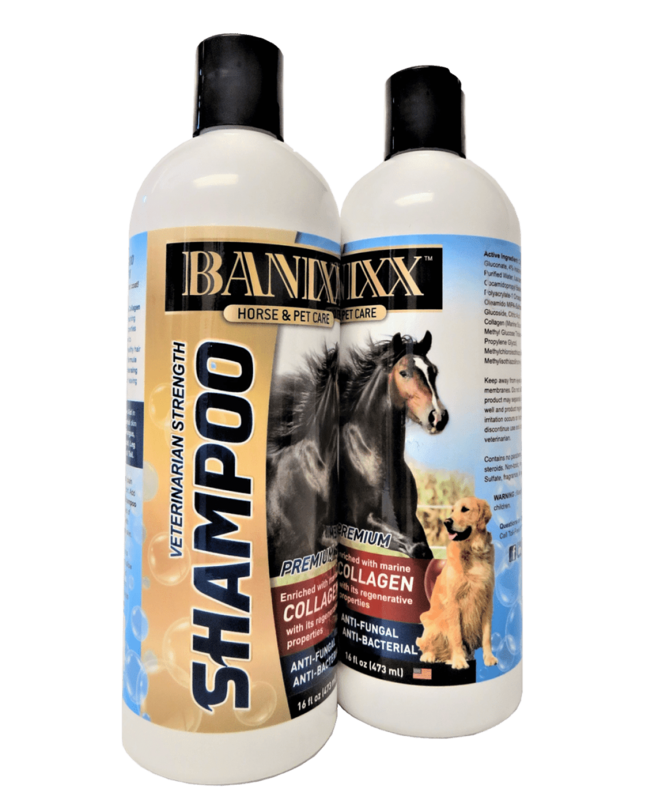 Thankfully, Banixx Medicated Shampoo has already shown amazing results on Equine Cannon Keratosis. However, since keratosis is a systemic problem (not merely a case of simple surface leg fungus), it will require regular routine attention to resolve fully. Best Horse and Dog Shampoo!